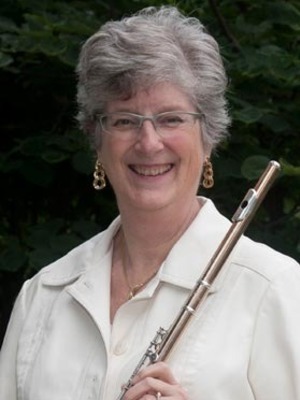 Katherine Borst Jones, professor of flute at The Ohio State University since 1985, has served as chair of woodwinds, brass and percussion since 1999 and of orchestral instruments since 2010. She was the recipient of the School of Music Distinguished Teacher award in 1995 and 2012, and the Distinguished Scholar Award in 2008. She is a founding member and co-principal flutist of the ProMusica Chamber Orchestra (Miriam and Bernard Yenkin chair), a founding member of the flute/viola/harp trio COSMOS, which has performed at the flute, viola and harp association conventions, and the Jones/Norton Duo with harpist Jeanne Norton. Ms. Jones is also a member of the Columbus Symphony Orchestra and principal flute of the New Sousa Band, which performed at the 2009 WASBE and Mid-West Band and Orchestra clinics and has toured Japan, China and the United States extensively. Created in 1976 by Ms. Jones, the annual Flute Workshop for high school students draws students nationally to the Columbus campus. Ms. Jones conducts the OSU Flute Troupe, a flute choir that has performed at six national (NFA) and four state (OMEA) conventions and recently recorded for McGinty Music (mcgintymusic.com). In 2014 the flute choir music series, the KBJ Collection was launched with ALRY music. She has conducted flute choirs throughout the United States including the Alla Breve Flute Choir in Arizona and the NFA Collegiate Flute Choir (2000) and the National High School Flute Choir (1997, 2014). Professor Jones has served in many roles for the National Flute Association - as president twice, vice-president, 1992 Los Angeles convention program chair and as chair of development. She has performed at numerous conventions and was a member of the NFA delegation to the Soviet Union in 1989. She received the Distinguished Service Award in 2011. A chamber music enthusiast, Professor Jones was elected president of Chamber Music Columbus in 2016. She had previously served as a trustee on the education and outreach and program committees. In addition, she is a visiting professor at the Shenyang Conservatory of Music in Shenyang, China where she has performed and given master classes at two international flute festivals. She performed at the 2012 British Flute Society International Convention in Manchester, England. She was co-founder, teacher, and coordinator for the Robert Willoughby Master Classes at the University of New Hampshire for eight years. She has taught at Heidelberg College, Denison University, Emporia State University in Kansas, Oberlin Conservatory, Capital University, and at the American Institute for Musical Studies in Graz, Austria. Devoted to the creation of new solo and chamber music, in addition to the COSMOS commissions by Libby Larsen, Stephen Paulus, Stephen Main and Andrew Boysen, Ms. Jones has commissioned works by Stephen Montague, Michael Ruszczynski, Mark DeVoto, Dale Warland and Rudolfo Bubalo. Flute choir commissions and premieres include the works of Daniel Bukvich, Roger Cichy, Valerie Coleman, Thomas Duffy, Chris Norman, Matthew Saunders, Robert Spittal, Chris Weait and Tom Wells. She has performed for George Crumb, Vincent Persichetti, Donald Harris, Libby Larsen, William Bolcom, George Perle, John Corigliano, Bright Sheng, David Maslanka and Michael Daugherty; she also has premiered works by Jean Françaix, Peter Schickele (Thurber’s Dogs), Augusta Reed Thomas (Euterpe’s Caprice for flute alone), Michael Daugherty (Crystals) and Dana Wilson, among others. She has performed as soloist (Corigliano's Pied Piper Fantasy) and as a chamber musician in numerous Contemporary Music Festivals at Ohio State as well as in Society of International Composers conventions. Born and raised in New Jersey, Ms. Jones studied with Keith Brion, Robert Willoughby, Kyril Magg, Donald E. McGinnis, and Julius Baker. Her degrees are from the University of New Hampshire (BA), and The Ohio State University (MM). She also attended the Congregation of the Arts Program at Dartmouth College; the Oberlin Baroque Performance Institute; the Boxwood program in Nova Scotia; and the Savvy Musician Academy, where her team won the Audience Choice Award as well as second place for their project in the Venture Challenge. She has performed with symphonies, chamber groups and festivals around the world including the Columbus Bach Ensemble, American Chamber Winds and the American Wind Symphony. She is a frequent guest artist and clinician across the country and has recorded for CRI, d'Note and Summit recordings, including a flute and harp compact disc Paradise, with harpist Jeanne Norton. A recording of COSMOS commissions is due to be released. A tennis player, Ms. Jones enjoys sports, gardening, art glass, reading and her cat, Toby.